Atlantic Group's Newsletter "Stero Type"
Tom Zuhars and Lyra tell me that the Summer 1999 issue of the Atlantic Group's gay and lesbian newsletter called "Stero Type" includes an article on Tori. (Jewel is on the cover.) The article is called "Tori's Strength" and is a very good read. Read the Stero Type article. A Press Release from Atlantic Records, distributed by Business Wire on July 20, 1999, revealed additional details about Tori's new double album, "to venus and back" and also about the RAINN shoe promotion with Steve Madden. There is also an article at the SonicNet Music News Of The World site which mentions details from this release as well. The main thing is the name of 2 new songs that are going to U.S. radio. Well, I was able to attend the chat with Tori and Steve Madden that took place on Wednesday, July 14 from roughly 6:00PM to 7:00PM ET. The chat lasted for an hour and about 27 questions were asked. Most of them focused on the Tori Amos shoe that Steve designed for RAINN and RAINN itself. I was not surprised by this because the chat did include Steve and I thought it was important to talk about the shoe because it is for a vital cause. You can now read a full transcript of the chat on the Dent. An article at USA Today Online and in the July 16, 1999 printed edition of the newspaper list the VH1 100 Greatest Women Of Rock And Roll and Tori made #71 on the list. Aretha Franklin was #1. VH1 designated July 26- August 1, 1999 as 100 Greatest Women of Rock & Roll Week and had a TV special about it. Click to see the full list of the VH1 100 Greatest Women Of Rock And Roll. Heather Howell reports that the July 17, 1999 issue of Billboard Magazine has an article about Tori's new album on the front page. The article has the title, "Tori Amos Unveils "Venus": Exclusive: Singer Details Atlantic Live/Studio Set." This article is the same as the one posted at Billboard Online . Read the entire Billboard Article. If your idea of getting in touch with your inner child involves riding the subway naked or breast-feeding a piglet, this MP3-sponsored tour is for you. The ariticle is fairly informative, stating, "The few major tours routed through Florida in the sweltering season are bypassing Orlando and its O-rena for venues in Tampa and South Florida." The article also states, ". . . scheduled sporting events haven't gotten in the way of booking the rare big names coming through Florida in upcoming months, which include John Mellencamp and the double bills of Jeff Beck/Jonny Lang and Alanis Morrissette/Tori Amos. However, some promoters and booking agents think of Orlando and Tampa as one big market and end up choosing to play only the Ice Palace [in Tampa], a larger venue where they can make more money - assuming the show sells out . . . A privately owned venue like the Ice Palace may share some of the risk of promoting a show, Stoll said. Different venues also offer different amenities and levels of service, which may be a factor, he said. And he feels that in theme-park filled Orlando, a promoter has to consider the greater level of competition for consumers' entertainment dollars." There is a short article about Tori's upcoming tour with Alanis in the July 8-22, 1999 issue of Rolling Stone Magazine (Issue 816/817 with Nicole Kidman on the cover.) Thanks to Gabriel Laverdiere for telling me about this. The article includes this interesting sentence, "Each show will be broadcasted live on the tour's Web site, with attendees able to write on-the-spot reviews at computers set up at the venue." I am assuming they are talking about alanisandtori.mp3.com. Just don't forget to send your reviews to the Dent as well! Here is the full article from the magazine. I also have a scan of the article with the photos from Toriphile Lily Matini. There are two things that Tori Amos never leaves home without when she hits the road: good food and better wine. "There's a chef here [near her home in England] that makes a killer Greek meal," says Amos. "I'm bringing him on the road. Alanis put me in charge of food and wine. I'm hoping she handles hair, because I'm not known for having any knowledge on that end." And the vino? "I have some good Tuscan 1990s that I've been saving; some great '96 whites from France; I'll do a bit of California," she says. "But we never drink before the show - only and ALWAYS after." For the twenty-six-date arena and amphitheater tour, each chanteuse will play a seventy-five minute set, preceded by an opening band plucked from the MP3.com web site. "We want to give some of these bands a chance," say Amos. "They need to have a shot." Each show will be broadcast live on the tour's web site, with attendees able to write on-the-spot reviews at computers set up at the venue. Amos is currently mixing her new, as-yet-untitled album, which will be accompanied by an extra disc of live material from her 1998 US tour. But don't expect to hear a ton of new material. "I'm not going to bore anybody," she says. "The record won't be out until the tour is over, but I always put new stuff in, and the set changes every night. The light guy rolls his eyes at me, but at least he can't do as much crack." 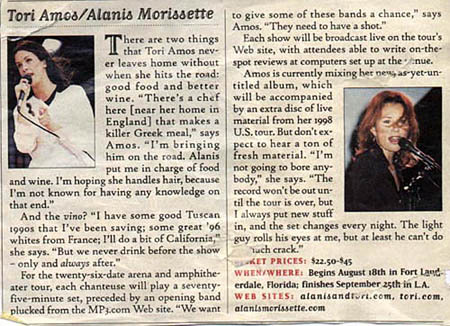 sweetcan kindly informs me that there is a mention of the upcoming Tori/Alanis concert tour in the July 1999 issue of Vanity Fair magazine. (Will Smith is on the cover.) Tori is featured on a spread with a bunch of other artists that are touring this summer. There is a small mention of her as well in the accompanying paragraph: "ODD COUPLES: Bob Dylan hooks up with Paul Simon for a unique co-headlining tour. Unafraid of competition, too, is Alanis Morrissette, who'll share a bill with the equally intense Tori Amos." There is a drawing of many of these artists on pages 106-107. sweetcan included a scan of the Tori/Alanis part of the drawing and you can see it in my Articles Archive. The name of the artist who drew it is Risko and I like it! ok, in the section called "in the studio" it says tori amos, project: TBA 2xcdset(atlantic) due: fall location: live on stage and near amos' home in cornwall, england notes: in addition to one full-length cd of new songs, the set will include a live disc recorded during amos' 1998 u.s tour. this is accompanied with a small pic of tori. in a section called "road rage! get out and see some music" it says: tori amos and alanis morissette will team up to headline the "5 1/2 weeks tour," which runs from aug. 18 to sept. 25. the tour is being sponsored by best buy and the internet music-access leader mp3.com. tori is also included in a section called "14 artists who shaped a.p." which says: you've seen 'em here before, and you'll see 'em again--these are the acts who've grown up alongside a.p. and shared the many phases of our 14-year history. here we celebrate our anniversary with a photo album of never before seen outtakes from some of our favorite shoots. it's only fitting that tori amos arrived by covering nirvana's "smell like teen spirit." amos found the pathos in kurt cobain's accusatory anthem and made it clear that at its heart, the song so many angry young people had been embracing was about being scared and alone. while the bands around her were hiding their pain beneath sludgy guitars, amos was speaking about tough subjects with such forthrightness that she inspired a cult. her most recent album, from the choirgirl hotel, is a bed and breakfast for weary souls with wicked thoughts. there, the bitterly disappointed stay up all night in search of understanding, and the goddesses offer a compassionate shoulder. throughout most of the album, a vulnerable and enraged-sounding amos addresses the trauma of a woman who has lost her baby. still, there's great beauty and playfulness in the songs that concern her recent marriage, and likely even a happy ending on her upcoming double-disc set, due this fall. the other 13 artists are: nine inch nails, beastie boys, jane's addiction, korn, ministry, rage against the machine, nirvana, deftones, the cure, marilyn manson, red hot chili peppers, rob zombie, and soundgarden.